AWARD-winning Doig & Smith, one of the UK’s biggest and most successful construction consultancy practices, has appointed Ayr-based creative agency Paligap to take over its marketing communications strategy. Established 70 years ago, Doig & Smith has expanded in size and in service provision, and now has branches in Glasgow, Edinburgh and London as well as many site branches in varied locations throughout the UK. Today Doig & Smith is a fully integrated firm of Chartered Surveyors offering services and specialist skills including Quantity Surveying, Project Management, Facilities Management and Construction Law. Its list of clients and portfolio of projects are impressive by any standard. Doig & Smith were involved in high profile projects such as the build of the Royal Bank of Scotland’s World Headquarters in Edinburgh, Heathrow’s new East Terminal and the redevelopment of Glasgow International Airport’s Terminal Building. Their other major clients include Scottish Media Group, Radisson Hotel Group, Edinburgh University, Goodrich Corporation and Rolls Royce. Paligap has now been selected by Doig & Smith to take over the company’s design and marketing communications, and has been commissioned to roll out a new corporate identity for the company at the beginning of September. Work is already well underway, and senior partners at Doig and Smith have already given the thumbs-up to initial concepts. Paligap’s remit will include redesigning all internal and external communications, advertising, exhibition management and the build of a new company website. Paligap handle all elements of the communications mix covering branding, press, radio, TV and outdoor advertising, public relations and direct marketing, internet and print. 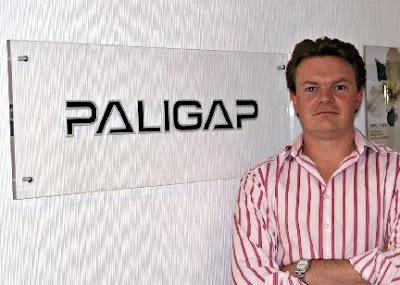 Paligap account director Graeme Niven said: “Our sole reason for existence is to boost our client’s business. Paligap is a member of The Elite Ayrshire Business Circle. The Elite Ayrshire Business Circle is an association of some of the top companies in Ayrshire. Its purpose is to publicise its members, and to celebrate and promote the rich diversity of industry, commerce and business services available within the county boundaries of Ayrshire in southwest Scotland. Members include the Clydesdale Bank, Ayr Racecourse and the Western House Hotel, and member company activities include estate agency and land management, chartered accountancy, legal services, brand management, web design and public relations consultancy.